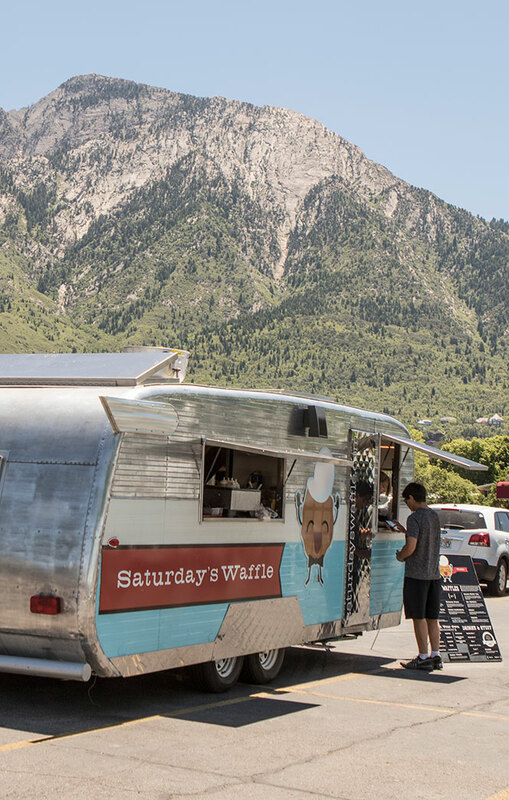 Utahns have never shied away from the outdoors in the wintertime, so it should come as no surprise that they are willing to brave the elements to enjoy gourmet food-truck cuisine. But how do the 100-or-so Utah food-truck vendors satisfy their customers’ desire for piping hot cuisine in the chillier months of winter? 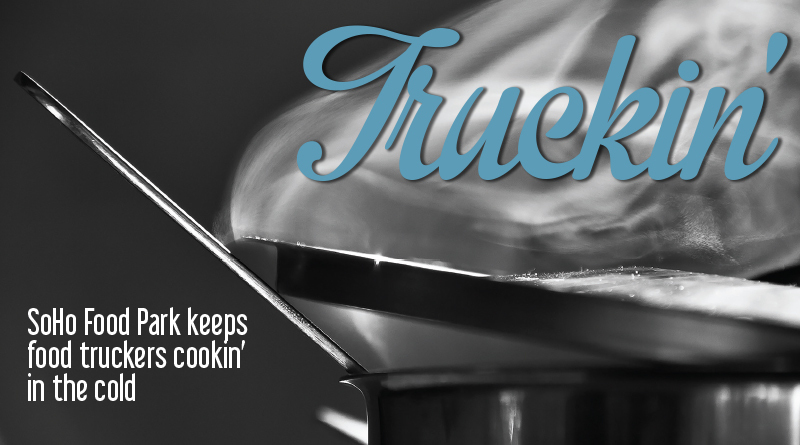 The answer, say truck owners, is to build a community of supporters and work with like-minded vendors. And while Food Truck Thursday at the Gallivan Center and the Food Truck Underground have become central gathering places, Holladay’s new SoHo Food Park seeks to provide more for both the food truckers and the diners who frequent them. 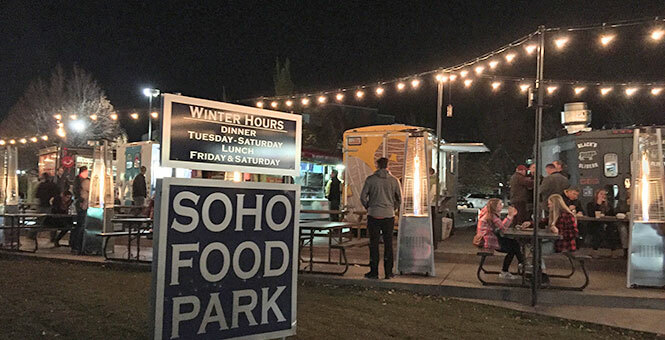 SoHo (South Holladay) Food Park is the brainchild of owners Mark and Shelly Olsen, who spent several years working with the city of Holladay to change the laws to allow their food-truck park venture. “We wanted to create a place that’s friendly for the food trucks, where they can plug into power without the noisy generators, and where it’s just like a restaurant, only the person bussing the tables isn’t the same person providing the food,” Mark says. The Olsens look for three things when deciding which food trucks make the SoHo Food Park cut. “Food quality, safety, and they have to be friendly, nice people,” Mark says. Shelly personally vets each truck by visiting them at other venues before inviting them to SoHo. This way, she says, “We can make sure that no matter what food truck customers are eating at, they’re enjoying that experience.” The Olsens have approximately 30 trucks in rotation to fill their six permanent spots each day and they work diligently to make sure that there are no similar cuisine types or direct competitors together at any given time. “It’s important that there is variety, and [that] you know you have six very unique restaurants,” she says. Track down the intrepid trucks online as well as via Facebook and Twitter. New Chow Truck owner J. Looney. 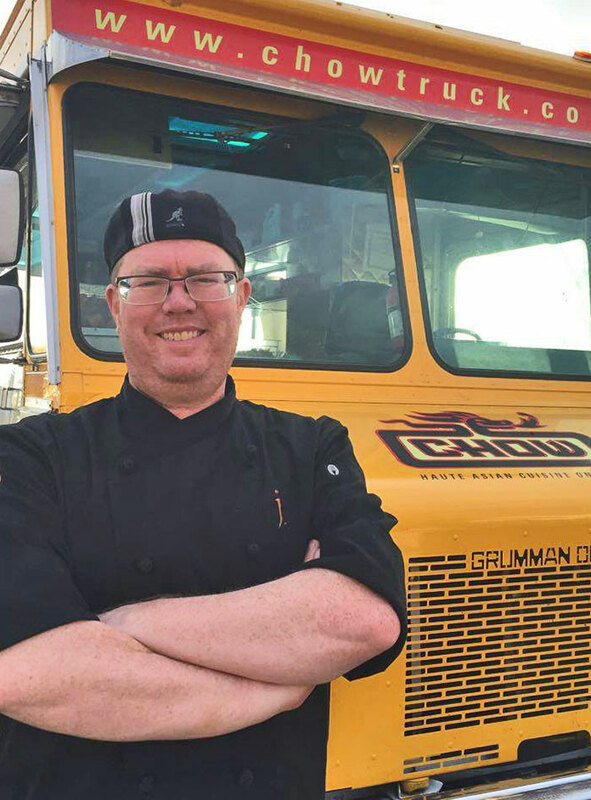 Utah’s original gourmet food truck, Chow Truck, brought new meaning to mobile food. Back in 2010, founder SuAn Chow cooked up the concept of Asian-inspired California fusion cuisine on wheels and paved the way for hundreds of Utah food trucks to follow; laying the groundwork that SoHo Food Park is now expanding upon. On Nov. 1, 2015, Looney got behind the wheel of Chow Truck and hopes to bring it back to its former glory in 2016. “We are going to get back to basics and make sure we are the best at what we do.” His strategy is to bring his truck “where the people are so they can enjoy this fantastic food and get it super fast,” and SoHo is part of his plan. By sticking to the core menu that Chow initially designed for speed, Looney intends to deliver the Southeast Asian flavors he loves and that Chow Truck is known for at a pace unusual for gourmet trucks. “Our average ticket time is a minute-and-a-half to two minutes,” he says. Looney worked on the Chow Truck for two years prior to purchasing it and learned the ins and outs of the business. He’ll maintain the core menu but put his own spin on the menu with regular specials. Look for the carne asada taco with pickled red peppers, Thai basil chimichurri and a ginger garlic aioli. Looney smokes the pork for two hours over hickory, then puts it over the char grill for a nice sear, and finally braises the beef for about six additional hours. His January special is a Japanese braised pork belly with coriander wasabi aioli and Asian slaw. Good ramen is art in food form—so you might not expect much when it comes off a truck. 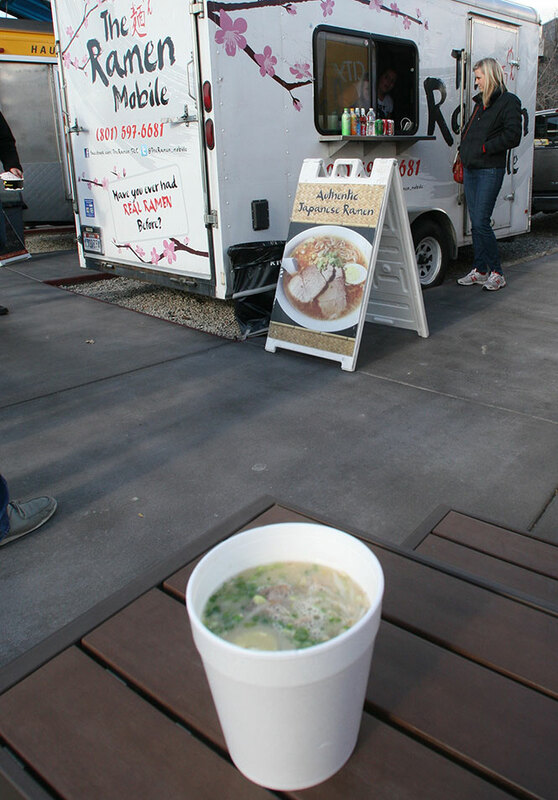 But The Ramen Mobile has limited its menu to just four winter offerings to perfect its authentic Japanese broth. The Ramen Mobile owner, Miwako (Miwa) Hunter, highly encourages slurping all items. Try the classic Piggy Ramen for creamy tonkatsu pork broth filled with noodles, egg, green onions, bean sprouts and, of course, tender slices of pork roast—not your traditional char siu—but filling and flavorful on a cold winter’s day. There’s also the miso Nummy Ramen, a soy bean paste-based broth; and the soy sauce (shoyu) Happy Ramen. Or take a spicy spin with the Devil Ramen, a choice of base broth kicked up a few notches on the heat scale. Of the truck’s offerings, the most popular slider is Scooters Southern Fried Chicken, based on Black’s Southern family secrets. “We take great care to put out the most authentic food, so we use a special brine and seasoning, with a prep that takes well over 24 hours,” he says. Balancing heat and savory flavors, the chicken is fried to golden-brown perfection and then served on a bun with all the right fixings. 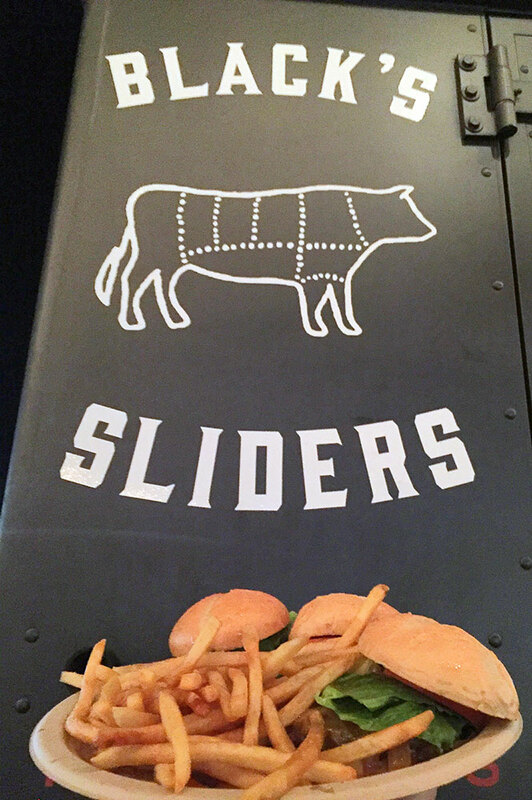 Black’s Sliders focuses on locally sourced products and hormone- and antibiotic-free meats to provide customers with the healthiest experience possible. Says Aaron, “Our menu has been constructed with the goal to bring an elevated dining experience to the mobile setting.” Slider enthusiasts agree. 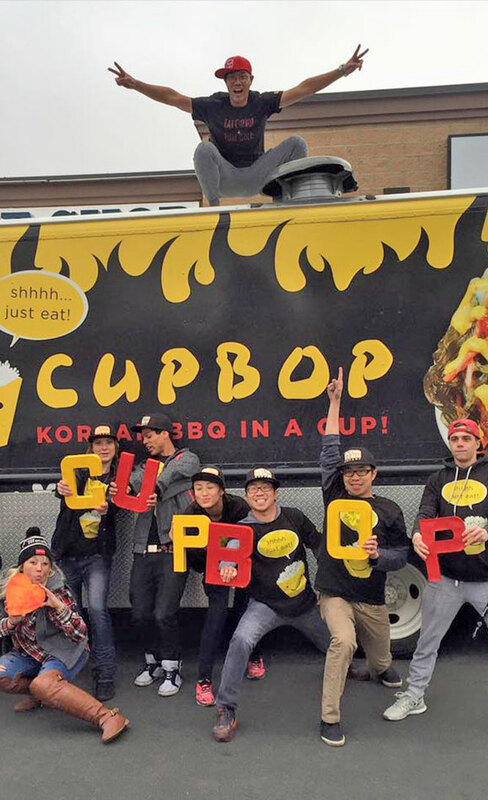 Cupbop’s slogan, “Korean BBQ in a Cup,” is surprisingly simple but gets at the tremendous flavor packed into each bowl. Order the combo cup for the biggest burst of savory, sweetness and heat; choose two barbecued meats (beef, pork or chicken) over rice and lettuce. A side of Korean noodles completes the dish, Korean-style vegetarian bops also are available. Conclude your visit at the SoHo Food Park with a sweet ending from Saturday’s Waffle. Here the Liege waffle takes center stage—containing chunks of pearl sugar for caramelized sweetness in every bite. Owners Mike Law and Richard Larsen have crafted their sweet dessert waffle menu to include the Maple Bacon waffle with crunchy bacon bits, S’more drizzled with Speculoos spread and the Bananas Foster waffle mounded with slices of fresh banana, cinnamon foster sauce, coconut whipped cream and crunchy pralines. A new winter special is the Peppermint Express: a chocolate Liege waffle topped with chocolate whipped cream, white chocolate peppermint sauce and crushed peppermints. Baby, it’s cold outside, but not too cold for the intrepid SoHo food truckers.